The new Veterans Resilience Center is currently under renovation, with plans to open in the spring of 2017. Warriors Helping Warriors is a non-profit organization dedicated to helping all veterans. As the name implies, the group hopes to bring vets together to help each other through shared experiences. Kevin Conley and his wife Tina founded WHW in 2013. Through the foundation, they hope to make the transition to civilian life easier for returning soldiers. At the same time, the want to offer support to families during this adjustment period. The Conley family knows first-hand how difficult the readjustment can be for a vet, especially one who has suffered traumatic injuries. Conley had proudly served in the Delaware Army National Guard for more than 20 years, rising to the rank of Major before retiring in 2011. When he came home from Afghanistan in 2010, he was very different from the father and husband who had deployed months earlier. He came back with obvious physical injuries sustained in the line of duty. He also has “invisible” injuries, including post-traumatic stress disorder and neurological issues resulting from a traumatic brain injury. Conley was welcomed home by a loving family, and they have been determined to give him the support he needs while on the path to wellness. One of his greatest challenges has been the uphill battle to get proper medical treatment through the VA system. “We had to cut through a lot of red tape to get Kevin the care he needed,” Tina said. To date, Kevin has endured nine surgeries for his medical issues, such as back, neck and knee injuries, and loss of feeling in his leg and both hands from nerve damage. His medical care is ongoing. Warriors Helping Warriors aims to educate the community about critical issues facing veterans. Despite the difficulty he faces, Kevin rises each day determined to keep pushing forward. As a family, the Conleys want to make the road to physical and mental wellness less challenging for Kevin and other veterans. Their solution was to start Warriors Helping Warriors. The idea for the organization took hold when Kevin attended a veterans event and reconnected with some of the men from his Delaware National Guard unit. According to Tina, the younger vets don’t always know what benefits they are entitled to receive. Unlike the Conleys, they may not be as adept at fighting for what they need. Tina and Kevin want to connect with other veterans and ask, “What are you finding as issues in your health care and other areas of your life?” Most importantly, the Conleys want to help. Warriors Helping Warriors has a powerful mission statement: To enable veterans and their families to ‘Win the War at Home’ so they can transition back to functioning families and back to productive members of society. As a result of his injuries, he is more accident-prone now, and his fine motor skills are poor, which is very frustrating for him. Kevin has some mobility issues and suffers from anxiety, stress, anger, and depression due to his PTSD and TBI. Conley’s struggle is much the same as that of many other vets. Through Warriors Helping Warriors, veterans can talk with people who have shared experiences and find ways to help each other. These were simple projects, but certainly life changing for the recipient. “We just wanted to get word out that help was available for veterans and their families,” Tina said. Word did spread, and people also started calling to volunteer their time. With extra hands, assistance is not just limited to making repairs. The volunteers will also help with transportation to appointments and assist with caregiving. Tina and Brynn take care of a veteran with a seizure disorder when his wife attends school. “Her choice was to quit school or find help,” Kevin said. Kevin and Tina are very knowledgeable about what resources are available to vets and their families. They hope to educate people not only about benefits but also how to deal with the bureaucracy of the VA system. “We have not been afraid to kick down doors,” Tina said, laughing. They are happy to share their experiences with others fighting the same battle. Warriors Helping Warriors is currently working on a project that will help expand services for veterans and their families. They are opening a Veterans Resilience Center. The non-profit has purchased a dilapidated mansion on South Broad Street in Middletown. The Victorian house sat empty and neglected for several years, with parts of the structure open to the elements. Renovation work (all volunteer) has started on the outside. As soon as a structural engineering report is approved, interior work will begin. Kevin added, “If you are in the military, you’ve never had to interview or write a resume. You may not know how to take the work you did in the service and translate it into marketable skills.” The classes will be open to vets and their family members. UPS and Bank of America have agreed to help with the interview and resume classes. The second floor of the center has been designed as a flexible living space that can house up to eight people. The plan is to provide vets (and families if needed) a place to live for up to one year while they get back on their feet. “Some people do not have a family support network they can rely on,” Kevin said. For these vets, finding a place to live can be a challenge. Without support, many veterans become homeless. Tina recalled how Kevin presented the family with three black lab puppies before he deployed. “So we wouldn’t be lonely while he was gone!” she said, laughing. The dogs are treasured family members who helped them through some rough times. Warriors Helping Warriors is a new organization, but the response from the community has been overwhelming. “People see our Facebook page or hear about us and reach out,” Kevin said. It’s not unusual for Tina to get messages daily from people who want to volunteer or donate. UPS is a huge supporter and routinely sends a group of volunteers down to work on the house or assist with repairs for vets. They are also donating a storage unit where WHW can put donations until the house is ready. Local electricians and plumbers are donating their time to help with the renovation. “We hope to find some experienced veterans to work alongside the professionals,” Kevin said. Out of the blue, they received a $7,000 check from the American Legion in Smyrna. “Someone gave them our flyer and they just sent a check. We didn’t even ask them!” Kevin said. To help offset the cost of the renovation, WHW has started an Adopt-a-Room program. Home Depot has adopted the kitchen and will provide all the appliances. This year, Warriors Helping Warriors became a United Way designated agency for people who want to donate to a local charity through the United Way. 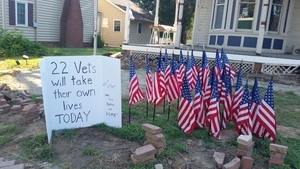 Vets want to make people aware of their presence in the world. “People look at Kevin and think he’s not injured,” Tina said. “And I’d like to think the way we are living our life helps Kevin be a productive member of society.” But the truth is that a lot of our veterans’ disabilities are not just physical, they struggle daily with invisible injuries. “In a way, this is therapeutic for Kevin.” Tina said. While helping others, you often find you are helping yourself. Warriors Helping Warriors is hosting a series of fundraising 5K races. The next race is on Nov. 12. Visit www.whwonline.org, or the group's Facebook page, Warriors Helping Warriors.